Happy New Year’s Eve!! What is everyone up to tonight? Last night I arrived in SLC, so I’ll be enjoying the snowy and mountainous surroundings and quality time with two of my blogger besties, Emily and Rachel. Tonight we are heading into Park City for dinner, and I plan to wear this new Philosophy dress I scored during the NET-A-PORTER end of season sale. 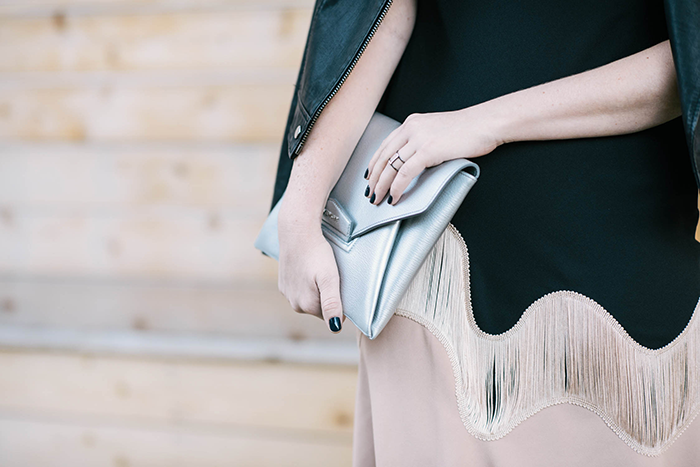 It’s such a beautiful basic – the neutrals are subtle and go with a bunch of different accessories, and the fringe adds a bit of glam without that flapper look. It’ll be a go-to in my closet for weddings later this spring! Unfortunately it is no longer available for purchase, however you can rent this dress via Rent The Runway! Additionally, I scoured the web to find a bunch of similar fringe-adorned dresses (also on sale! ): this Alexander Wang number, this Lanvin sheath, and this stunner by Stella McCartney. 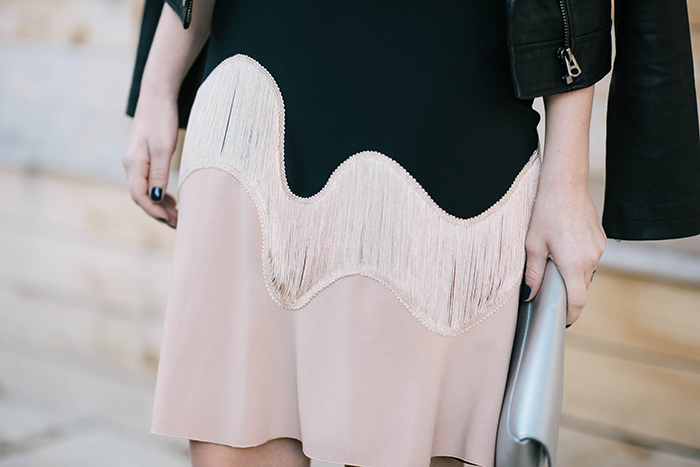 Stella actually made quite a few fringed pieces for fall/winter, including this dress and this one as well. If you have your eye on spring, check out this one too! Whatever your plans are for tonight, I hope you all have a very safe, happy and fun New Year’s celebration! Cheers to 2015 being the best year yet! Wow, this dress is amazing! I love the colorblocking and fringe aspects! Gorgeous! 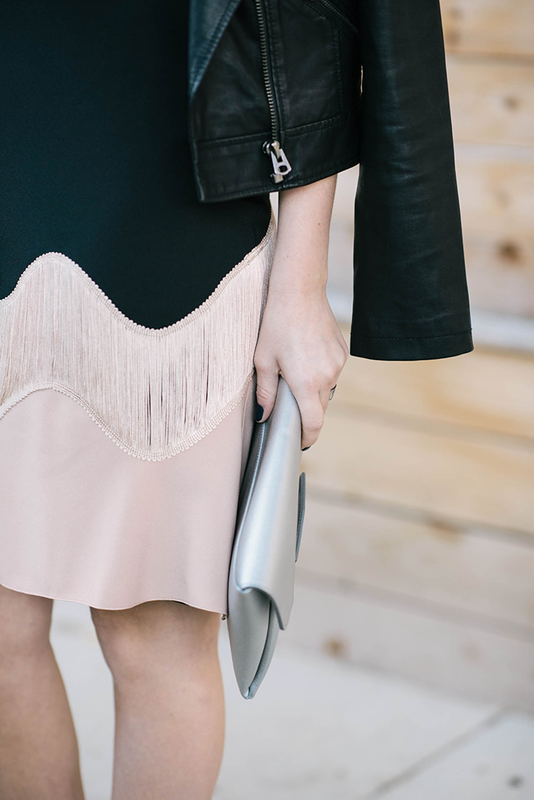 Love the fringe and color combination. You look gorgeous! Have so much fun tonight! That dress is beautiful and love it with the leather! Beautiful, classy dress! Happy new year! Happy new year Merritt, that dress is gorgeous. You look great! Have fun in Utah and and New Year! Oooh, this is such a cool dress and I love the edginess of the jacket! 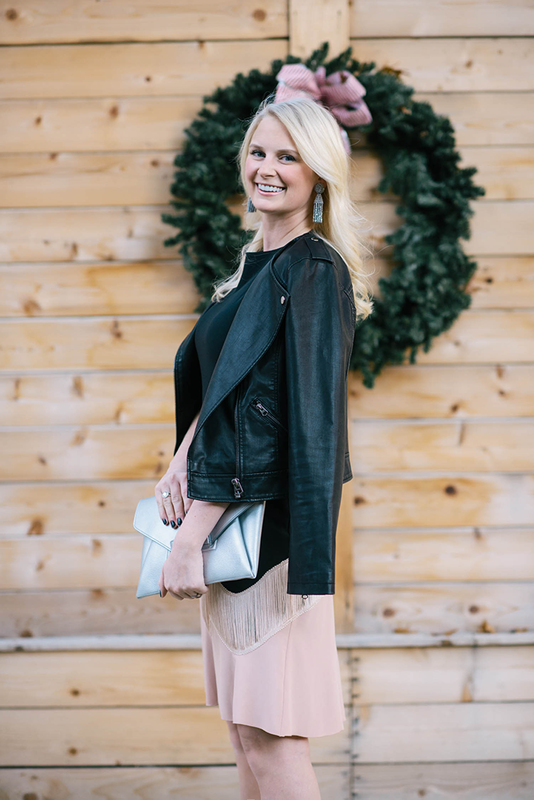 I’ve loved watching your blog grow this year, Merritt and I can’t wait to see what’s in store for you in 2015! So fascinating how you’ve somehow managed to grow so much taller. Using the skinny app much? Gross, Merrit. Honestly. If you’re going to be a fraud about your body like your gals in Utah, at least have them apply the app so nobody notices you’re super short and stumpy. So tacky! Thanks for your kind thoughts, Beth – while normally, you may be right about some bloggers, I’m actually 5’9 in real life, and have recently gone through a health change and have now lost over 10 lbs in the last two months which I am very proud of. As far as my friends in Utah – they are fabulous. And you know what’s tacky? Coming on here and berating me for things you know nothing about. Happy 2015! I’m loving this post! You look darling and that dress is incredible!! Such a unique piece! !